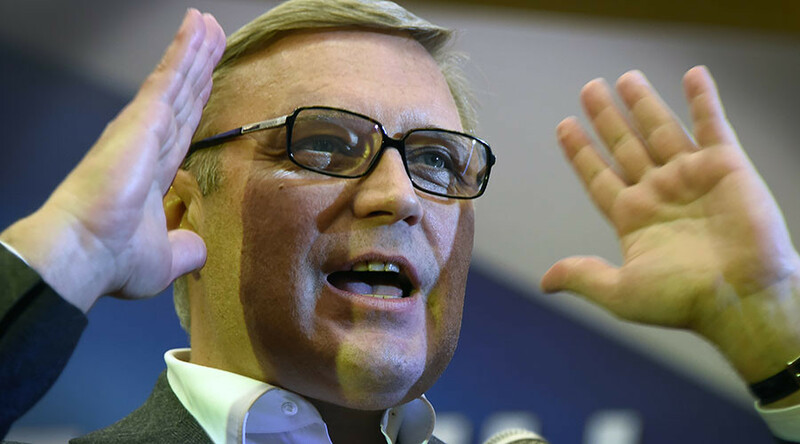 Former Russian PM-turned opposition leader Mikhail Kasyanov had eggs hurled at him as he arrived in the central Russian city of Vladimir for a press conference. Just days ago, Kasyanov was pelted with cream cakes while in a Moscow restaurant. The attackers first tried to use piles of snow to block the doors of the conference center where Kasyanov planned to hold his speech, and when the leader of the PARNAS party arrived on site they started throwing eggs and shouting slogans calling for him to leave Russia. Kasyanov was not hurt and most likely was not even hit – his bodyguards stood in the way of the missiles hurled by critics. Several eggs hit the politician’s car, though. PARNAS called the attack “a minor incident” and assured reporters that their co-chairman was safe. According to Russian news agencies, the Vladimir attack was launched by activists of the so-called National Liberation Movement (NOD) – a nationalist-conservative group with ties to lower house MP Yevgeniy Fyodorov of the centrist party United Russia, which currently holds the majority of seats in the State Duma. Fyodorov is known for many radical statements and proposals. These include a bid to criminalize any foreign sponsorship for Russian politicians, the motion that would automatically introduce sanctions against countries that conduct anti-Russian policies, a ban for Russian citizens to join military forces in certain nations, and a promise to force the nationalization of Google. He also actively promoted a broad ban on US dollars in Russia, claiming that the excessive dependence on the currency hurts the Russian economy. The Vladimir egging took place just two days after a group of people threw cream cakes at Kasyanov in a Moscow restaurant. The attack was taken by the PARNAS leader much more seriously – he went to the nearest police station and filed an official complaint for assault. The police started an administrative case that is now being investigated. However, another PARNAS leader, Ilya Yashin, claimed the people who threw pies at Kasyanov were Chechens. He then drew a connection between the attack and the statements made by the leader of the Chechen Republic, Ramzan Kadyrov, who has repeatedly accused the non-system opposition and minor parties such as PARNAS of betraying Russian interests and serving foreign special services. A short time ago Kadyrov posted an Instagram video in which Kasyanov was shown in a rifle scope’s crosshairs. The move caused an outcry among opposition figures and Instagram administrators quickly removed the clip, alleging it had insulted other members of the community.